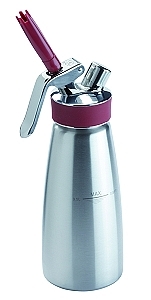 The iSi Gourmet Whip PLUS cream whipper is designed specifically for the professional or hobby chef. Constructed of heavy-duty stainless steel with a brushed finish, the Gourmet Whip is an essential kitchen ingredient for the easy preparation of soups, light gravies and sauces, delicious desserts and toppings, as well as frothy vegetable and fruit Espumas. Some of many features of this commercial grade whipper include: a stainless steel fixed dispensing valve for precise application and control, a non-slip lever for a sure, temperature-safe grip, and it has a crescent shaped drip stop at the base of the decorator tip which allows excess drippings to escape before they reach the lever. List price is $135.00. Our price is $109.95. You save $25.00! One cream charger is used to charge each bottle so buy some extra chargers when you order your bottle to save on the shipping. Click here for extra chargers.